« Who Looks Best in Giuseppe Zanotti Heel-Less Wedges: Juliette Binoche or Rita Ora? ‘Spring Breakers’, the new movie featuring Vanessa Hudgens, Rachel Korine, Selena Gomez, and Ashley Benson, is about to be launched, so the stars are out promoting their flick in style! We spotted the leading ladies at a recent photo call in Madrid, and they each looked very pretty and polished. Even though I spotted a little chip on Vanessa’s toenail polish (we’ll forgive her this once), I still admire their feminine and well put together looks. How cute is the print on Rachel’s dress!? I love that she added a pair of bright heels for a pop of interest and color. Selena’s top is to die for! I love that she added sleek black pumps with a hint of sparkle to complement her chic ensemble. 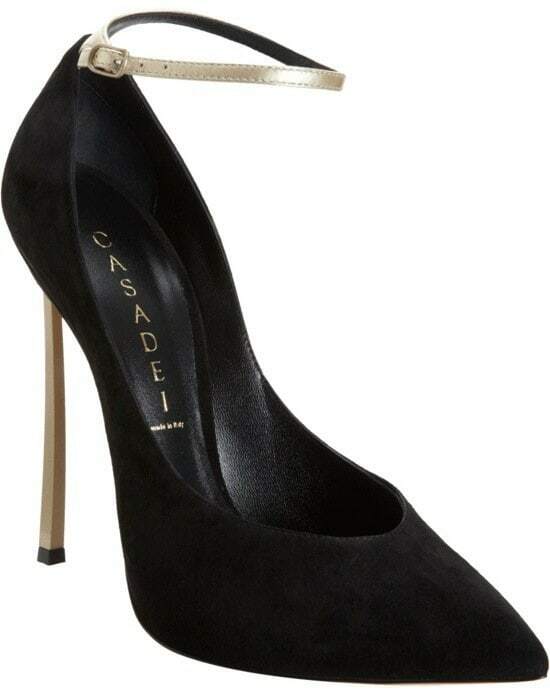 She was wearing the “Blade” pumps from Casadei in black with glitter heels. Below is a similar pair of black Blade pumps. Like I mentioned above, Vanessa’s less than perfect polish is throwing me off a little. But I do like that she chose soft lilac shoes to add to her all-white outfit! These “Popp” sandals are from Jerome C. Rousseau’s spring 2013 collection. You can check out other amazing styles from this label at Gilt! Do you know who made Rachel’s or Ashley’s heels? If so, spread the shoe love and share!